I now realize and accept, with a toddler in the house, the inevitability of plowing through recipe after recipe for chocolate chip cookies. Despite my best efforts to entice her with other baking adventures — “Let’s bake cupcakes! Let’s make cake! Let’s make bars filled with chocolate and condensed milk! !” – she will firmly insist on cookies. That’s not to say she doesn’t eat anything else. She loves cupcakes and can massacre a piece of chocolate cake like a wild little gremlin after midnight. But when it comes to baking, cookies take the cake (pardon the pun). In all fairness, I shouldn’t exaggerate. It’s not like we’ve baked together a hundred times. I suppose it’s not quite a disaster that she hasn’t yet the interest to bake layer cakes and éclairs. She’s only 3 after all. And it’s not like mama is all that fancy either when it comes to baking. When did we pin our aspirations on our children? Sigh…one of the things I said I would never do when I was a mother. But I am also slowly realizing, and accepting, that being a mom sometimes (oftentimes) means breaking the rules you’ve set for yourself before that little bundle of life-changing energy came into your life. And anyway, you can never have too many chocolate chip cookie recipes. – In the bowl of an electric mixer cream the butter and sugars with the paddle attachment on medium speed until light and fluffy, about 3 minutes, scraping down the sides of the bowl as needed. – To the butter and sugar mixture, add the vanilla, whole egg, and egg white. Beat this on low speed until well combines, scraping down as needed. Add the flour mixture to this in two batches and mix until just combined. Add the chocolate and walnuts and mix through with a wooden spoon. – Shape 2 heaping tablespoons of dough at a time into balls and place about 1 1/2 inches away from each other on a parchment-lined baking sheet. Bake in a pre-heated 375F oven for 12-15 minutes (Martha says 18, but 12-15 minutes is good enough for me…you might feel differently). – Let the cookies rest on the baking sheet for 1-2 minutes before transferring to a wire rack to cool. For this baking jaunt, I decided to turn to that archetype of American domestic goddess-ness, Martha Stewart. She had 3 cookie recipes that seemed good candidates: a chocolate chip chocolate cookie, a white chocolate chip, and this dark chocolate chunk. I presented the page with the photos of the three to little C and she unwaveringly chose the chocolate chunk. So here we are. This makes that particular type of chocolate chip cookie that goes buttery crisp at the edges. Don’t try to make the cookie smaller than what it calls for in the recipe because I believe it’s the size that allows for a super crisp edge coupled with a gooey and chewy middle. Get the best dark chocolate to use as the chocolate really shines here. I used a combination of chocolate chunks and chocolate chips only because I didn’t have enough bar chocolate. When I chop my bar chocolate I don’t worry too much about getting the chunks all the same size. On the contrary, I prefer them to range wildly from hefty chunks to flattish shards to powdery rubble. Each contributes to a cookie that appears to have both layers, and glorious melting pockets, of chocolate. 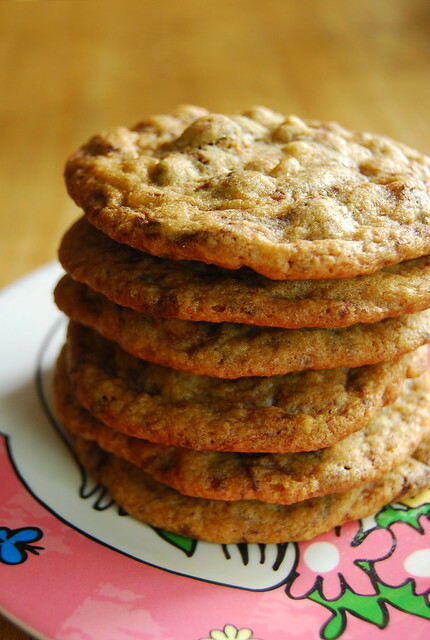 I did have one addition, and I’ve marked it as optional – I added walnuts because I love them in chocolate chip cookies and feel that they are a much needed crunch and contrast to the sweet, oozy chocolate. Like a lot of chocolate chip cookies, these are best warm out of the oven, and certainly on the same day. As such, I suggested you do what I do, which is to only bake what you are likely to consume and freeze the rest of the cookie dough in logs for future consumption (and having cookie dough in the freezer, on the ready for rainy days and heartaches, is really one of life’s great insurances!). Or, you can take stock of all the children that live in your building and send out cookie care packages accordingly. Today, I made a batch of chili con carne and when little C piped up to help I put her beside the bowl of beef, into which I was massaging the spices. She looked at me dubiously. I gave her some spices to mix together in a small bowl and she was much happier. And as I looked at my daughter enjoying herself in the kitchen I felt happier too. Maybe expecting a 3-year old to stick her hand into a bowl of raw beef was a bit too optimistic on my part. Her pace, her place, her joy…each of us follows the beat of a different drummer. May she always find the confidence to follow hers and may I always have the wisdom to know when to let her. I can not make a gooey chocolate chip cookie. Why are mine always fluffy?! I will be using this recipe for the holidays!